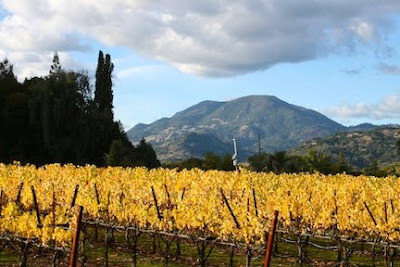 To my blog readers, near and afar: thank you! I hope that this blog is helpful to you. 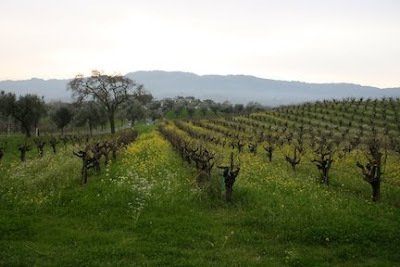 I began it for my students here in Calistoga, in the Napa Valley, but it has found readers from all over. The internet is a wonderful thing, isn't it? If you're particularly enjoying this time of harvest and changing colors, I invite you to visit my painting blog at www.karenlynningalls.blogspot.com, where I have posted photos of autumn vineyards in the northern Napa Valley, around Calistoga, and photographs from the First Annual Calistoga Scarecrow contest (you'll be amazed by the creativity of the scarecrow makers). And may you have a happy Thanksgiving! Someone once told me that if you were to open a caterpillar's cocoon before it emerges as a butterfly, what you would find would be green goo. The caterpillar essentially has to dissolve in order to reconstruct itself in its new form, and go through a complete transformation. This is a lot like the process of painting! 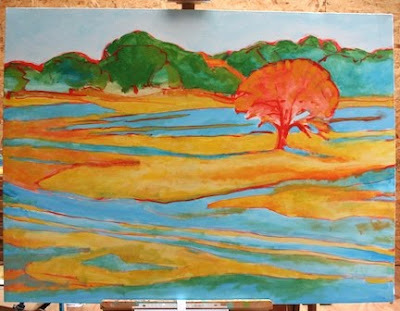 You start out by creating the essential underlying structure or gesture of the painting, and everything seems very clear as you block in the big shapes. 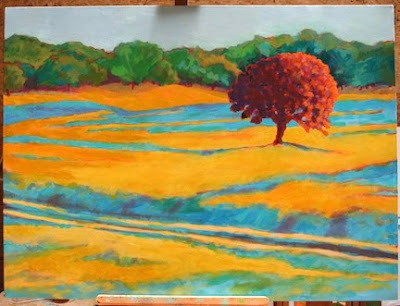 Then, as you get further into the painting... something happens. Clarity dissolves. You want – what color there? Is that really working? Those shapes look weird. What WERE you thinking? It just doesn't seem to be coming together. This can be very depressing (if you let it). What it actually means is that you are right on track. (You didn't expect to hear that, did you?) You are in the Green Goo phase of the painting. It's most helpful (and not easy) to remember that a butterfly WILL emerge, as long as you follow the process all the way through. Sticking with it at this point can be difficult. You may feel frustrated – you may want to chuck the whole thing. 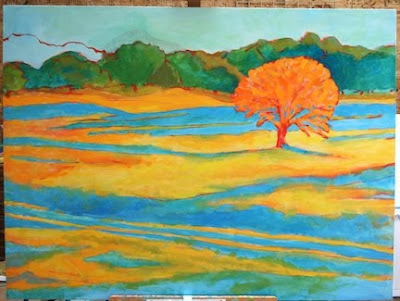 Stepping away from the painting for a little bit – an hour, a day or two or three, a matter of weeks, a matter of months – may be a good solution when you're really stuck. Then come back to it. You'll be surprised how, suddenly, you'll see the next step you need to take. I have had some paintings wait years. I have some paintings waiting for me now... easily a dozen or two. Morning Celebration has been waiting for a few months now. But the butterfly will emerge! Don't be hard on yourself; just trust the process. If it feels difficult and frustrating and everything seems confused and unclear, remember: you're in the Green Goo phase of the painting. You're right on track. 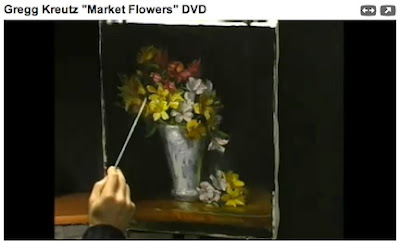 When you're beginning a painting from a subject, the same principles apply, whether it's a still life, landscape, or portrait, and whether it's realist, impressionist, expressionist, abstracted, or some other style. You can only take one step at a time – and you can't get to the end before you've begun. Generally, new painters want to skip the preliminary steps and go straight to painting luscious detail. 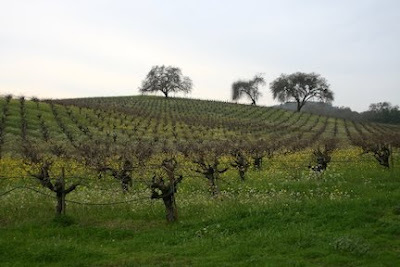 But – you can trust me on this – if you skip the preliminary steps, you will go far awry. Then you'll get depressed and frustrated and want to chuck the whole thing - pain that you can save yourself by just taking things one step at a time. 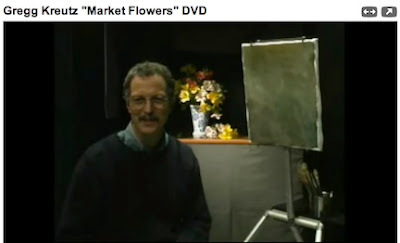 In this demonstration, Gregg Kreutz "Market Flowers" DVD from Liliedahl Video, on YouTube, artist Gregg Kreutz begins by catching the essential gesture of his still life subject. 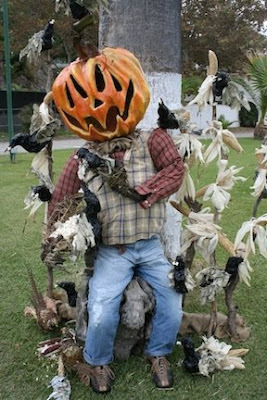 This also establishes the placement of the subject in his composition. Next, he begins blocking in the large shapes (he has toned the canvas beforehand). Then he turns his attention to the background. 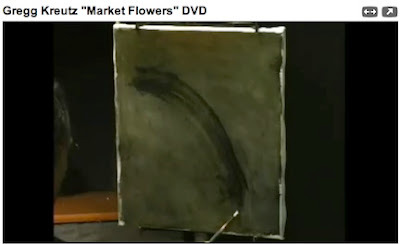 Notice as you watch the video that he does not paint with black – he mixes his darks, creating a much more interesting color. 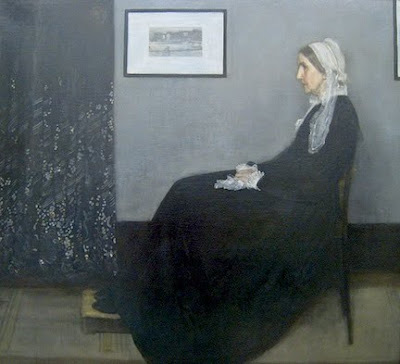 Only then, once he has established the basic shapes of the composition, does he begin to break the painting down into smaller shapes and greater detail. 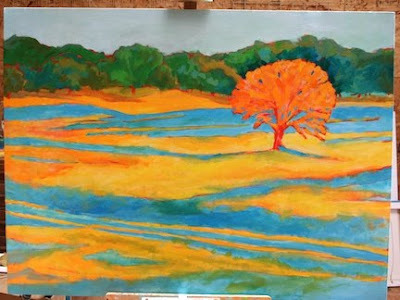 Here is the final painting, as he puts down the last brush stroke. Although this video clip doesn't show you the intermediary steps, he is very clear that how he has begun is essential for getting these lovely results. The process is the same, whatever style or genre you're working in: you can only take it one step at a time. 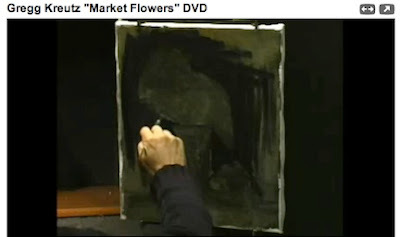 Robert Genn painting on location. 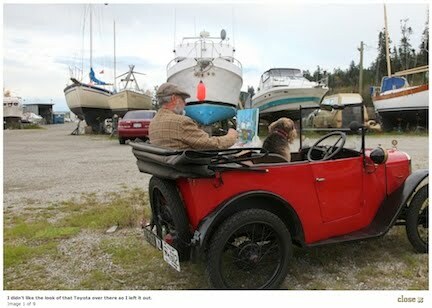 His caption for this photo reads, "I didn't like the look of that Toyota over there so I left it out." 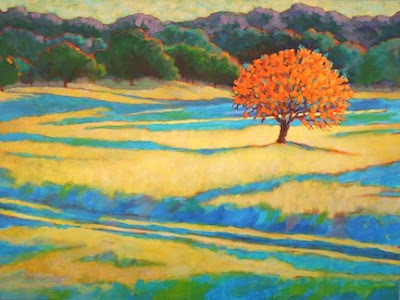 Robert Genn is a Canadian plein air landscape painter who works in acrylics, lives in British Columbia, and travels throughout the world painting. 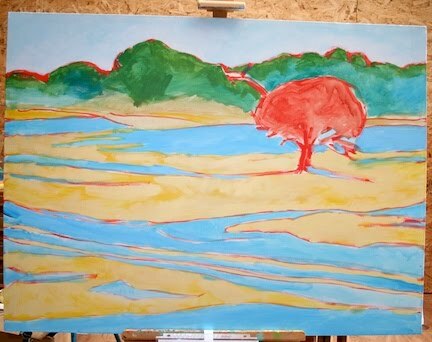 Twice a week he sends out a thoughtful email newsletter, a letter musing on something to do with art, the act of painting, the process of creativity, the business side of art, or life as it applies to art and artists generally. 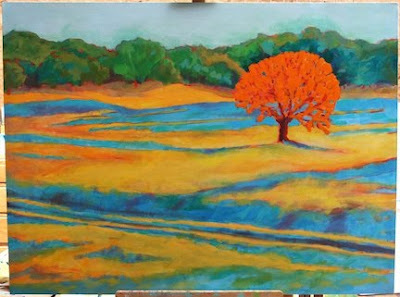 Artists from all over the world respond, and he posts some of the responses, with artwork, on his newsletter's website, www.painterskeys.com. 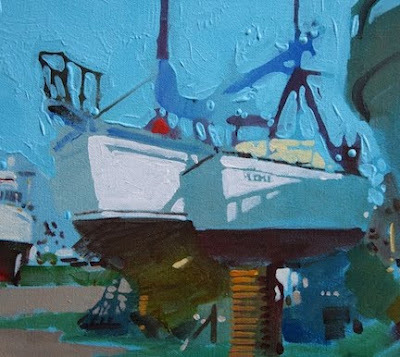 In his post, Light and Shade, Genn writes about painting boats on location, thoughtfully explaining and demonstrating his process. 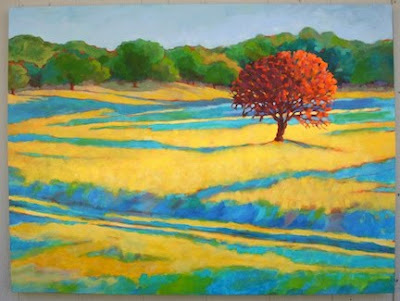 He blocks in "general shapes and patterns early on, while keeping only a partial eye on the eventual lay of the light. 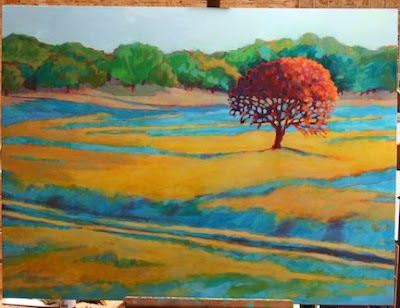 In other words, the strongest light areas go in at about the half-way stage of the painting." Notice how he is thinking in terms of the big shapes? He's not concerned with details, even the details of light and shadow, as he begins. Then he sharpens things up by painting the negative shapes, seen clearly in the sky. Notice how he uses the sky to shape the masts and railings of the boats? You can see the photos online above his post "The divided self," from October 29, 2010. His final steps, as he puts it, are "strengthening design, heightening colours, gradating sky," and finally, "Get it stopped and think about it in a frame." 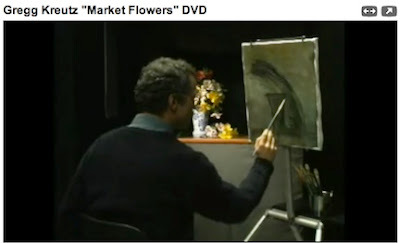 You can enjoy Robert Genn's newsletters twice a week, too, as I have for a good bit over ten years now, by subscribing at his website at www.painterskeys.com. I said in the last post on this subject (for both previous posts, see Seeing the Big Picture - I and Seeing the Big Picture - II) that there are two simple things that will help you see the big picture. (Only two? Nyaaah... humor me here....) The first is making thumbnail sketches. The second simple thing that will help you see the big picture is squinting. Squinting reduces the amount of light entering the eye, and allows us to see things more in terms of value (lightness and darkness) than color. It allows us to mimic night vision, in a way. At night, our ability to see color is limited, so we see objects as variations of light or dark. Without getting too technical, it has to do with the rods and cones in our eyes, which determine how we see (you can find a scientific explanation of them at The Rochester Institute of Technology Center for Imaging Science, or a more easily understandable explanation at the University of Washington's Neuroscience for Kids - obviously very smart kids). So squinting helps us see large areas of similar values. If you squint at the photographs above, in this post, where are the light patches? Where are the dark patches? 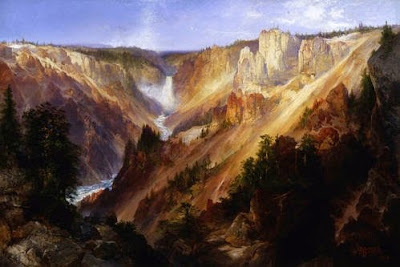 If you squint at this small image of Thomas Moran's The Grand Canyon of the Yellowstone, where are the light patches? Where are the dark patches? In this most highly detailed painting (you can see a larger version of it here), can you see the bigger picture? Thomas Moran, like Albert Bierstadt a painter of monumental scenes of the American West (this canvas is 8' x 14' in size), was able to incorporate lots of splendid details into this enormous canvas, but it wouldn't work unless he was very clear about the big shapes – about the big picture. Calling all block printers! 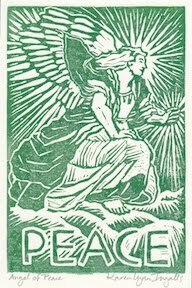 (Well, in the area, anyway....) This Saturday, Calistoga's Community Presbyterian Church (also known as The Green Church) is opening its doors for a special block printing studio day, November 6th, from 10:00 a.m. to 5:00p.m. This is non-instructional time – it will be just printers, inking and printing away, sharing the time, and generally having a lot of fun and making a lot of prints, together. You could think of it as a printmaking quilting bee, of sorts. If you'd like to print collographs or monotypes in the company of other printers, you're welcome to join us! 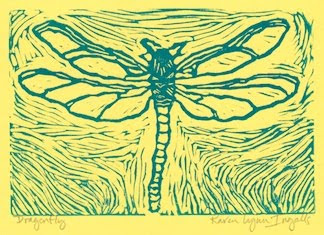 Whether you're printing cards for the holidays, or a series of prints, or experiemting with the medium, you are welcome. This is time to print and share the printing process with other printers. So what do you bring? Your block, paper, water-soluble ink (no solvent-based inks! ), brayer (that has not been used for solvent-based inks), a surface for inking (plexiglass sheet, disposable paper palette pad for acrylic painters, or printer's bench hook), and your creative spirit! Cost? A donation to the church to thank them for their generosity in opening their space to us, and to cover their costs. Where is the Green Church? 1407 3rd Street, at the corner of 3rd and Berry Streets (just across from the Orthodox Monastery and down the street from Calistoga Elementary School), in Calistoga. What do you do to participate? Join us this Saturday! It would be great if you could let me know in advance, too - you can send me an email at karenATkarenlynningalls.com or call at 707.942.0197. And our thanks to the church for welcoming us!